I had to do the other half of the clouds, as well as the trees and leaves. The guy by the tree is just an anonomise guy from a picture I found (If he was from an anime, I didn't know about it), but He's shaded out so it doesn't really matter right? its good , cute and i like it. The orangey brows in the background are really nice and set the scene beautifully for the character. 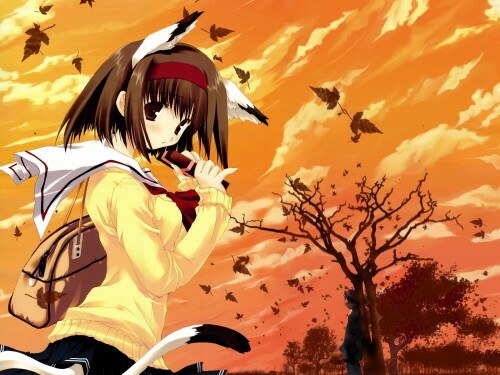 And as above, the cat ears are teh cute ^^ . Very pretty wallie! I like the pic you used, she is very cute^^ and the bg looks so awesome! ah, i almost didn't notice the guy by the tree, haha, wow, very cool idea! Great job, keep it up! heya!! soo pwettie! me like the autum style!! the leaves are nice!! the scan is cute!!! the colors really blends!!+fav! i give this one a 10 out of 10, awesome job. Yaaaaaaaaaaay, Ari-chan's back and she's doing more spiffy walls! *happy dance* I love this one, even though it's not the season. The sunset-cloud effect is especially appealing. Fave! I just love what you did with the Colors and also a great Job with the nice looking falling Leafs in the Background. hmm not a bad wallpaper Ari-chan.^^ I love the color of the background and that it fit's with the title. The cat ears are cute. ^^ Greato job! It's a neko girl!!!! Cute. lol. Ari-channnn... XD XD beautiful scene in autumn season and afternoon . Hello Ari-chan!! Wow!! A very very nice wallpaper!! I love it! Your the best!! Sorry for my bad english... i'm spanish. que bueno!! !, me encantan las imagenes con chicas preciosas, felicito al creado o creadora Yokatta!!!!! this is soo great i like it alot, the bg is beautiful, you done a great job Ari-chan :) :) , it's going to my +Fav :D.